During our holidays we had gone for the community experience to various houses. It was the happiest time for three of us to be in Vasai. We, Joyly, Rubi and Aruna Paola reached Vasai on the 3rd of May. The community welcomed us joyfully. Though initially there were some inconveniences we adjusted fast and were very happy to be of help to the sisters. It was our first community experience and we were helping with the household duties, and in the book centre. We were also taking turns for the liturgy. We enjoyed being with the sisters. We appreciate all the sisters for being good, loving, caring and encouraging us to take part in all the community activities. Those who come to the book centre we served them joyfully. We really felt that we are serving the Lord through our book centre specially when they took bibles, spiritual books, CDs, VCDs etc. We are grateful to Srs. Gloria and Ivy for their guidance in the apostolate. We learned many things from Srs. Apparajitha and Aminah about propaganda. We are grateful to Srs. Stella and Virginia for their generosity and guidance in the community work. On the 13th of June for the fest of St. Antony we went to pray in a family where many people had come. Then on Saturdays of the month of June we went to display our books in Remedy parish and we were happy to serve the people who came to our stall. In two months we learned a lot for our lives and time went fast. It was a happy experience for us and we will remember it always. We started our journey from Nagpur to Secunderabad on 29th of April in the morning and reached in the evening at 7.30 pm. Sr. Vincent had come to take us from the railway station. When we reached home Sr. Tara the superior of the community welcomed us warmly and then all the sisters together welcomed us in the refectory during supper with their smiling faces and by clapping their hands. During our stay in Secunderabad we learned many things; such as serving the people in the book centre and how to welcome people in the centre when they enter in, how to speak to them etc. We were happy when people used to take books because we know that we are giving Jesus’ love to them. Sometimes we used to make mistakes and sisters used to correct us. Whenever we had the turn for prayer, Sr. Theresa used to help us to prepare our prayer. We used to play Uno with the sisters and we really enjoyed the community living. 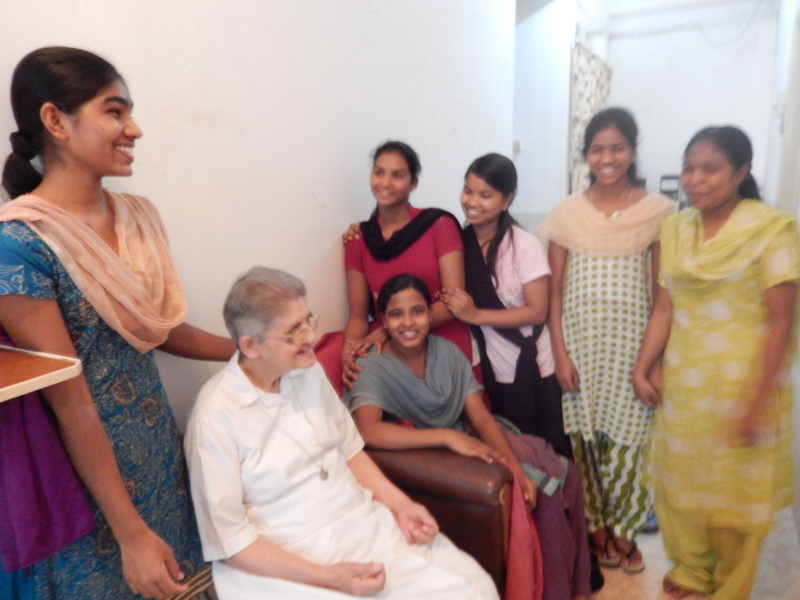 By living in the community with the sisters we came to know the real life of the sisters. They live like one family. So we had a very good experience of everything. 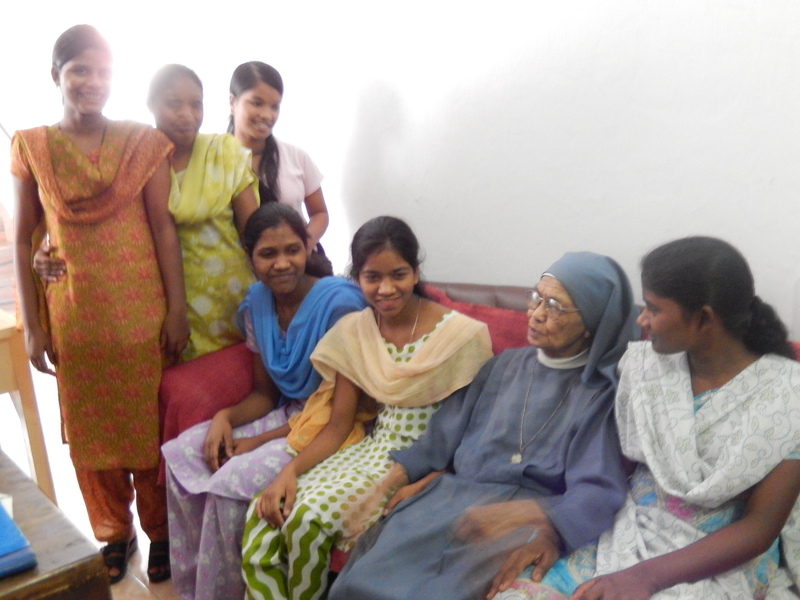 In the community of Secunderabad all the sisters are like angels. Thank you dear sisters for your prayers and support. We are really strengthened in our Pauline vocation. On 25th April, on the Feast of St. Mark, our dear Sr. Grazia said good bye to us. It was a day which brought us Daughters of St Paul, specially the Bandra Community, a shock and deep sadness, to know that after two sisters had passed away in the month of March, one more sister within a month is leaving us for her eternal reward. I had sent you a message on 11th April saying that Sr. Grazia began to show signs of declining health, her haemoglobin was low, and she had infection all over the body. The chemotherapy could not be continued and she was taken to Holy family for the transfusion of blood, for she had reached the 4th stage tumour of the urinary tract. Sr. Grazia had a very peaceful death although she suffered intensely. After the documents of sr Grazia was ready, she was taken to the Bhaba hospital morgue until the 27th morning around 7.00 am when she was brought back and placed in our chapel. Not a minute passed when prayers were not said or hymns sung, in order that the ambience be almost like the one she was approaching – that of heaven. As soon as the body was placed in our Chapel we prayed again as a community the Office for the Dead. The funeral Eucharist began at 9.00 am and the Chapel was overflowing with the relatives and well-wishers of our dear sister, and of the Congregation in general, including members of the Sister Disciples of the Divine Master and the Society of St Paul. Rev Fr George Kaitholil, the Vice Provincial of SSP presided over the Eucharist and in his homily he highlighted the aspect of hope and trust so beautifully and powerfully. Truly Sr Grazia was privileged to be led through a carriage of prayers of the Pauline Family who were far from lacking on this day. Her face was looking very peaceful and radiant. Sr. Vimala gave short introduction about Sr Grazia and Sr. Ancy John proposed the vote of thanks in which she also testified about Sr Grazia’s life. The choir helped us all to praise God using our voices melodiously. Before the Eucharist ended, the Funeral Rites were carried out by Fr Michael Raj, the Provincial Superior of SSP in the Chapel itself and closed the coffin, suggested by Mr. Elroy the funeral undertaker, due to extreme heat. Two buses were arranged to proceed to the Sewri Cemetery for the burial. The grave was blessed by Fr. K. V. Sebastian SSP and while an appropriated song was being played, and all showering petals of roses and other flowers, the coffin was lowered down into to the grave. The wreaths and candles were then arranged on the grave beautifully at the end of the entire proceeding. Sr Grazia was a person of prayer, she believed in the Lord, who promised his continuous assistance. She worked hard and taught her successors to love the work and motivated them, whether they were our young ones in formation, young sisters in various communities or the co-workers in the Catholic Enquiry Centre; she was a great teacher, for she really put her heart and mind into the responsibility entrusted to her, by using all her talents and creativities in whatever work she was called to carry out. Sr Grazia’s brother-in law, her nephews, niece and their families, were present for the funeral. There were also sisters from the communities of Ahmedabad, Goa, Mangalore, Nagpur, and Secunderabad, besides the sisters from Borivli and Vasai. There were also several relatives of our sisters who participated in the funeral Mass as well as accompanied the body to the Cemetery. The Lord visited Sr Grazia and called her for her eternal reward and the memory of her lingers in our minds ever fresh and we keep her in our prayers. She was truly a Pauline apostle who offered her life in dedicated service of the Word with great love and zeal. May she obtain for our Province all the graces needed for our life and mission.